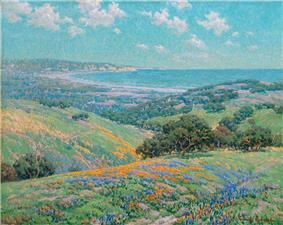 Granville Redmond (March 9, 1871 – May 24, 1935) was an American landscape painter and exponent of Tonalism and California Impressionism. He was also an occasional actor for his friend Charlie Chaplin. Granville Richard Seymour Redmond was born in Philadelphia, Pennsylvania on March 9, 1871 to a hearing family. He contracted Scarlet Fever at around 2½ to the age of 3; when he recovered, he was found to be deaf. This may have prompted his family's decision to move from the East Coast to San Jose, California: the possibility for his education at the Berkeley School for the Deaf. Granville attended the California School for the Deaf in Berkeley from 1879 to 1890 where his artistic talents were recognized and encouraged. There his teacher Theophilus d'Estrella taught him painting, drawing and pantomime. When he graduated from CSD, Redmond enrolled at another CSD: the California School of Design in San Francisco, where he worked for three years with teachers such as Arthur Frank Mathews and Amédée Joullin. He famously won the W. E. Brown Medal of Excellence. He associated with many other artists, including Gottardo Piazzoni and Giuseppe Cadenasso. Piazzoni learned American Sign Language, and he and Redmond became lifelong friends. They lived together in Parkfield and Tiburon, California. In 1893 Redmond won a scholarship from the California School of the Deaf which made it possible for him to study in Paris at the Académie Julian under teachers Jean-Paul Laurens and Benjamin Constant. He roomed with the sculptor Douglas Tilden, another graduate of the California School for the Deaf. In 1895 in Paris his painting Matin d'Hiver was accepted for the Paris Salon. In 1898, he returned to California and settled in Los Angeles. He was married in 1899 to Carrie Ann Jean, a former student of the Illinois School for the Deaf. Together they had three children. It is not known if they were deaf or could hear. While living in Los Angeles, he became friends with Charles Chaplin, who admired the natural expressiveness of a deaf person using American Sign Language. Chaplin asked Redmond to help him develop the techniques Chaplin later used in his silent films. Chaplin, impressed with Redmond's skill, gave Redmond a studio on the movie lot, collected his paintings, and sponsored him in silent acting roles, including the sculptor in City Lights. Chaplin told a writer for The Silent Worker of a Redmond painting, "I could look at it for hours. It means so many things" and Chaplin's famous The Dance of the Oceana Rolls was Redmond inspired. During this time Redmond did not neglect his painting. Through Chaplin he met Los Angeles neighbor artists Elmer Wachtel and Norman St. Clair. They showed works at the Spring Exhibition held in San Francisco in 1904. By 1905 Redmond was receiving considerable recognition as a leading landscape painter and bold colorist. He died on May 24, 1935 in Los Angeles.